This cute and simple fixed-size ring represents the outline shape of an apple. Everyone loves apples! This cute and simple fixed-size ring represents the outline shape of an apple. Perfect for young and old, the stem of the apple ring sits on top of the finger. The height of the top part of the ring (from the band to the top of the stem) is approximately 8mm in height. 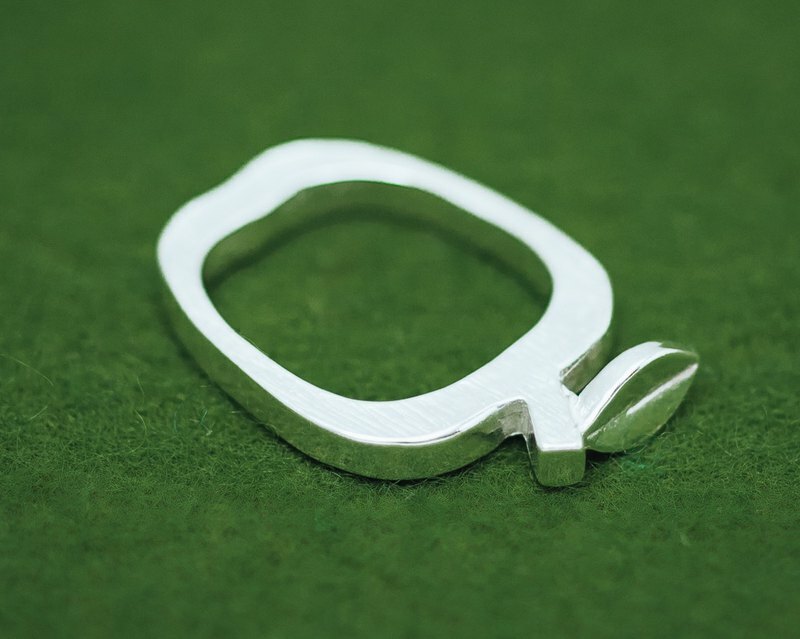 Due to the irregular shape of the ring (being apple-shaped) conventional ring sizing doesn't really apply, however if you let us know your usual US ring size for a round ring, we will do our best to make the apple ring the correct size for you. This piece is crafted in Britannia Silver 958, a high purity silver which retains its bright color (unlike sterling silver which tarnishes easily). We also provide a small zip lock bag in which we recommend to store your piece/s to keep them away from the air. This will help to keep them bright for a long time. We can also make this piece in 23K Gold Vermeil (23K Gold Plated Britannia Silver 958) upon request. The price will be approximately 25% higher, and will take 3-4 weeks depending on availability. Please convo me for a more accurate quote if interested. ------------ We are a husband-wife, husband's-parents, and two-production-staff team. We make fun handmade, original pieces for fun people. Come visit our store if you're in lovely Tokyo. Thank you for looking!